Perhaps the area in Alstone which has undergone the most changes in the past 200 years; and indeed, is still undergoing changes, is the area adjacent to St. James Square. The plans for the layout of the Square were made prior to 1809 but progress was slow, perhaps its proximity to the original workhouse in Knapp Lane, detracted from the area. 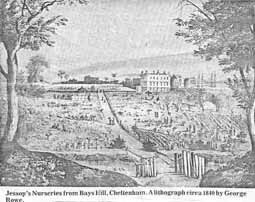 However, the development of nearby Bayshill, following on the visit of George III, encouraged local entrepreneurs to consider investing in the area. One of the first to do this was Charles Hale Jessop, who took over approximately 20 acres where he had built a beautiful, well laid-out botanical garden, which was to be opened to the public. It contained Hot Houses, Green Houses and Parterres as well as Aviaries, Pagodas and Rustic Fowl Houses. The gardens stood on a gentle rise at the bottom of which ran the river Chelt. In addition a broad gravelled path led to Bayshill. Such a lovely and gracious amenity right in the centre of the town could not fail to please and so St. James Square gradually grew up alongside it. However, other business men had their eyes on the site and there had been much dissatisfaction with the remoteness of the railway station at Lansdown. It was felt that the railway ought to be brought closer to the town centre, so in 1844 part of the gardens was sold to the GWR for a new station and, sadly, whilst offering the public a useful service it sounded the death knell for the lovely gardens. Though the station continued to serve the town - the first trains ran in 1847, no-one could deny that it had detracted from what was once a lovely rural atmosphere but, eventually, the station too, was closed down in 1966 and the site remained undeveloped for several years. Plan after plan was put forward and rejected. Eventually by 1993 the Cheltenham Borough Council Resources Committee recommended that plans to sell the entire 12 acre site should go ahead and that the land should be considered for commercial, residential and leisure purposes. It already had outline planning consent for office use and part of the site was taken up by UCAS (now moved to Pittville). In 1984 the Borough Council had rejected eight separate proposals for a superstore and car park on the site. Nevertheless, such a scheme eventually went ahead amidst much controversy for much had to be done, for example, clearing of toxic waste, demolition of old buildings in that particular area, which included the old Mill and Alstone Baths. Railways Sheds had to be demolished too before commence on the superstore could begin. Another important decision had to be made about access and new roads were planned linking Gloucester Road with St. George's Road with access to the superstore's car park. The Waitrose site contained 52,000 square feet and was to include a petrol station - the cost estimated to be �18 million and there was to be parking for 428 cars, and the linking of the new relief road brought the total cost of �30 million.At that time St. Gregory's School had been using the field on Market Street for games, and a bid was made for it. But in return Waitrose had to pay �2.5 million for an all-weather pitch behind the school, which, no doubt, was a vast improvement on the former playing field. The problem as to how to overcome the old Honeyborne Line which crossed Millbrook Street near its junction with Great Western Road. I had, for some years been a cycle track and the problem was solved, rather spectacularly, by the erection of a 'Sydney Harbour' Type bridge which, though impressive looks rather incongruous. Morrison Development had originally proposed building a leisure complex but as a similar scheme in Henrietta Street had already been given the go ahead, it was felt the town could not support two large leisure centres so Morrison withdrew their plans. This still left the land off Market Street and the old factory and abattoir sites. There was a great deal of controversy when Waitrose sold the land to Crest Nicholson Ltd. for 233 homes, but this prestigious development went ahead. Apart from a terrace of houses in Market Street, most of the site contains flats which are nearing completion. Although there has been some criticism one cannot deny that they are an improvement on the old Abattoir and market site. The River Chelt which passes through the site has been landscaped and it is difficult now, to determine where the old mill and spa was, and the Honeyborne Way walk and cycle track offer a rural escape from the stresses of everyday life. Thus, this once large area has changed from a rural botanical gardens, then a busy railway and back to some semblance of countryside of which, no doubt, Mr. Jessop might have approved.